Zhangjiagang Sunstar Machinery Co., LTD.
Add: Leyu industrial zone, Zhangjiagang City, Jiangsu Province, China. 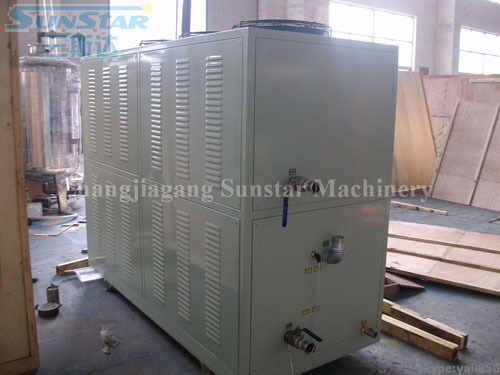 Chiller--- This series of frozen drink machine is with the production of steam, one of the essential equipment, through the rapid cooling, can significantly shorten the operating cycle time, improve production efficiency and from the surface with steam. At the same time, the aircraft is also the hotels, shopping malls, theaters, hospitals, chemical industry, textiles, precision instrument workshop, as well as high-rise buildings in central air conditioning refrigeration equipment indispensable. freezers and mold temperature machine composed of mixed units. This series of products imported Hermetic compressor (mainly France Taikang, the United States Copeland) and the multiple refrigeration compressor composed of several relatively independent of the cooling system.